As demonstrated by the recent subprime mortgage crisis, few topics in the real estate world are more important than finance. Understanding the monetary system, the nuances of home mortgages, and instruments of financial leverage at all stages of the market are essential for all real estate professionals. 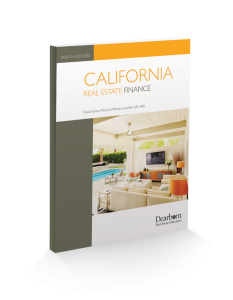 This book is designed to offer comprehensive instruction in real estate finance, while also satisfying California state licensing requirements. This book fulfills a prelicensing elective for salespersons and is a required course for all broker applicants.